The Black Tattoo - a book about demonic possession, flying kung fu, vomiting bats, the end of the universe and other fun stuff like that, by Sam Enthoven. What is the Black Tattoo? At the base of the skyscraper known as Centre Point Tower, in the darkness at the end of a dank concrete walkway, something stirred. 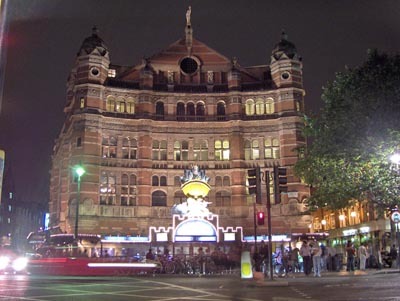 The Palace Theatre is one of the most impressive buildings in the West End – a grand and ostentatious mass of stripy pink brick festooned with turrets, glittering windows, and fat stone cherubs. 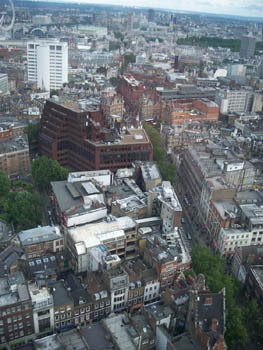 This is the view westward from Centre Point. You can see the BT Tower, which is going to make a spectacular (dis-! )appearance in my next book TIM, DEFENDER OF THE EARTH. Hee hee hee! Here's another panorama, looking east this time. A wonky angle from your hamfisted author/photographer, or a deliberate effect to simulate turning in mid-air? You decide! ;p The large green lozenge is the British Museum's Great Court, also mentioned in Tim. Jack had to admit, there was a pretty good view from the roof. London's streets were spread out all around him like the glittering threads of a spiderweb, the Thames cutting through them like a slash of darkness. 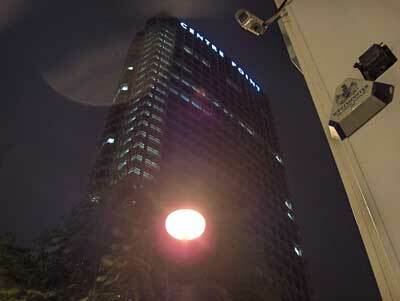 OK: it was early evening when we went up the tower, not the middle of the night when the passage occurs. 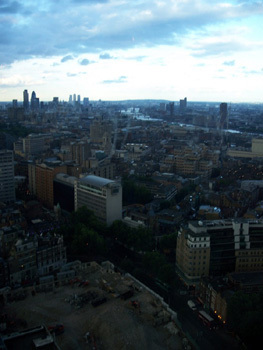 But I was certainly imagining again what it might be like to fly through the air over the streets of London. I hope these pics do the same for you!